Fans of Douglas Adams and P. G. Wodehouse will love visiting Jasper Fforde's Great Britain, circa 1985, when time travel is routine, cloning is a reality (dodos are the resurrected pet of choice), and literature is taken very, very seriously: it's a bibliophile's dream. England is a virtual police state where an aunt can get lost (literally) in a Wordsworth poem and forging Byronic verse is a punishable offense. All this is business as usual for Thursday Next, renowned Special Operative in literary detection. But when someone begins kidnapping characters from works of literature and plucks Jane Eyre from the pages of Brontë's novel, Thursday is faced with the challenge of her career. Fforde's ingenious fantasy--enhanced by a Web site that re-creates the world of the novel--unites intrigue with English literature in a delightfully witty mix. "Neatly delivers alternate history, Monty Pythonesque comedy skits, Grand Guignol supervillains, thwarted lovers, po-mo intertextuality, political commentary, time travel, vampires, absent-minded inventors, a hard-boiled narrator, and lots, lots more. . . . Suspend your disbelief, find a quiet corner and just surrender to the storytelling voice of the unstoppable, ever-resourceful Thursday Next." --The Washington Post "Fforde's imaginative novel will satiate readers looking for a Harry Potter-esque tale. . . . The Eyre Affair's literary wonderland recalls Douglas Adams's Hitchhikers series, the works of Lewis Carroll and Woody Allen's The Kugelmass Episode." --USA Today "[Thursday Next is] part Bridget Jones, part Nancy Drew, and part Dirty Harry." --Michiko Kakutani, The New York Times "Delightfully clever . . . Filled with clever wordplay, literary allusion and bibliowit, The Eyre Affair combines elements of Monty Python, Harry Potter, Stephen Hawking and Buffy the Vampire Slayer, but its quirky charm is all its own." --The Wall Street Journal "Jasper Fforde's first novel, The Eyre Affair, is a spirited sendup of genre fiction--it's part hardboiled mystery, part time-machine caper--that features a sassy, well-read 'Special Operative in literary detection' named Thursday Next, who will put you more in mind of Bridget Jones than Miss Marple. Fforde delivers almost every sentence with a sly wink, and he's got an easy way with wordplay, trivia, and inside jokes. . . . Fforde's verve is rarely less than infectious." 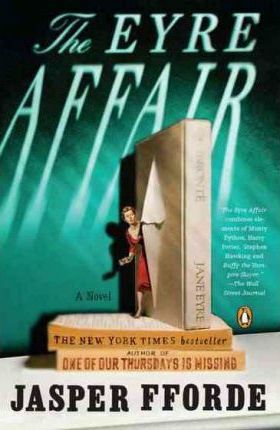 --The New York Times Book Review "Jasper Fforde's genre-busting, whoppingly imaginative first novel, The Eyre Affair, is packed with literary allusions . . . .Thanks to Fforde's terrific imagination, this definitely will not be the winter of our discontent." --The Miami Herald "For sheer inventiveness his book is hard to beat. The Eyre Affair is an exuberant mélange of crime, comedy and alternative history." --Houston Chronicle "The Eyre Affair by Jasper Fforde could hardly be more delightful. . . . It takes a bold adventurer to play fast and loose with literature, and that's what we have in Thursday Next and Fforde." --Newsday "[Fforde] delivers multiple plot twists, rampant literary references and streams of wild metafictional invention in a novel that places literature at the center of the pop-cultural universe. . . . It all adds up to a brainy, cheerfully twisted adventure." "A blend of suspense and silliness, two parts fantasy (think Alice in Wonderland meet Superman), two parts absurdity (anything by Carl Hiaasen) and one part mystery (Agatha Christie meets Sue Grafton)." --St. Louis Post-Dispatch "Her name is Next. Thursday Next. And her story is as amusing and intriguing as the summary of her story told within the pages of The Eyre Affair. Next is a literary detective in a world so enamored with the written world that Shakespeare's Richard III is staged nightly as if it were The Rocky Horror Picture Show . . . . The novel's writing flows and the imaginative twists and turns in Next's world are handled smoothly." From the author of THE CHRONICLES OF KAZAM series, including The Last Dragonslayer Jasper Fforde traded a varied career in the film industry for staring vacantly out of the window and arranging words on a page. He lives and writes in Wales. The Eyre Affair was his first novel in the bestselling series of Thursday Next series novels, which includes Lost in a Good Book, The Well of Lost Plots, Something Rotten, First Among Sequels, One of Our Thursdays is Missing, and the upcoming The Woman Who Died A Lot. He is also the author of The Big Over Easy and The Fourth Bear of the Nursery Crime series, and Shades of Grey. More recently Fforde's work includes The Last Dragonslayer, The Chronicles of Kazam series. Visit jasperfforde.com.